If you are travelling in Iceland, you might experience some things which are different compared to other travel destinations. Here are 10 things, which I recognised. Coffee is for Icelanders what wine is for French – they love it. Although, they would never use the word “love” as, like in other Scandinavian languages, you do not use this word very often, if ever. In Germany, I was trained to special coffee “times”, like in the morning or in the afternoon. But in Iceland there is always time for coffee. And in restaurants it is sometimes also included without saying. You often can either get a refill for coffee (normal coffee) or soups. Either it is already mentioned in the menue or you just can ask for it. More often than not you will get more for your money than you might think. I know, it is or at least was common in France that you can get tap water to every order in a café or restaurant. In Germany, e.g. this was never common. Iceland has one of the freshest and unspoiled tab water in the world and this is for free, that’s just great service (see also Nr. 8). In Iceland anyone is rather relaxed about vouchers, documents and passports. I guess it because it is such a tiny nation, everybody knows everybody and you easily can somehow trace someone back, if something went wrong. It is easy to keep the overview. This creates a really nice and relaxed atmosphere during your holiday. I have experienced at least three hotels (Hótel Cabin, Reykjavík Lights Hótel, Best Western Hotel) which have tiny rooms, regardless price or amount of stars. Even the upgrade would have not been much more romier. That’s because a lot of houses and buildings used to be either office rooms or buildings just have been not so big in the past, especially in Reyykjavík. But as the demand for hotel rooms is rising dramatically, everything has to be converted into hotels. I have the impression Icelanders are appealing to the sanity and reason. That’s why you will find an uncommonly small amount of fences, barriers or security signs. The man in the cover picture is basically standing IN Goðafoss, not next beside it. But as it was frozen, you didn’t realize it immediately. 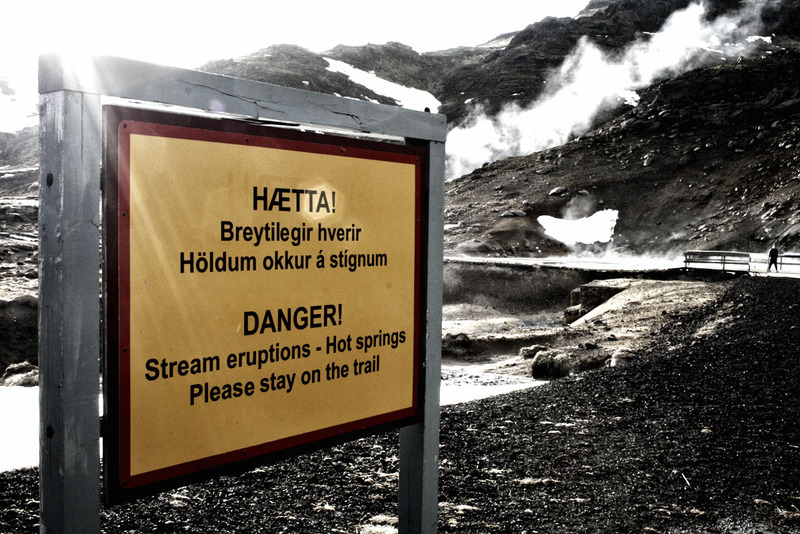 Also, in all the geothermal fields like Seltún, where the earth is cooking with 100°C and more, there are – if at all – tiny barriers. But I guess, this will change soon with the rising amount of tourists. Recently, there were tourists caught on the icebergs in the famous Jökulsárlón. To avoid deaths or sueings (third biggest tourist group are U.S. citiziens, who are experienced with lawsuits). Not to mention environmental protection aspects. Even in the remote highland areas like Þórsmörk or Landmannalaugar you will be able to pay with cash or credit card. 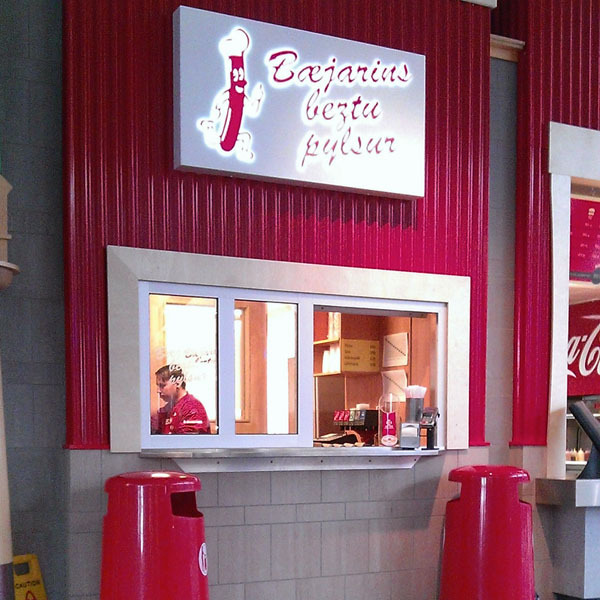 Or pay a hot dog (pylsur) at a kiosk. Like in every other Scandinavian country in Iceland this mean of payment is prevalent. The only thing so far, I wasn’t able to buy with my bank card was a cover for my bus ticket (100 ISK). Although there was a cash card terminal, but I guess the amount was just too small! Icelandic people are very helpful. Which I guess is due to their history. Without solidarity they wouldn’t have come such a long way through adamant winters, a woodless country, devastating diseases and nature disasters. Now it comes in handy for travellers: Broken shoes, stranded in the middle of nowhere, extraordinary demands? No problem, they will come up with a solution and help you out. It will take you some effort to name restaurants, hotels or other facilities where there is no (free) WiFi. As one of the most technologistic countries in the world, Iceland of course is well equipped when it comes to that. I keep on hearing and experiencing it myself: Food in Iceland is delightfully fresh and tasty. Einar, the chief in Volcano Huts during the summer once explained it that way: Iceland just produces a small amount of food on their own, but what they produce is of real quality. Freshly caught fish, lamb which was freely raised in the highlands or potatoes from farmer next door – they don’t have a mass production and therefore pay more attention to quality, not quantity. For all the remaining food they can’t produce themselves and need to import it, they pay attention to what is being imported. Which doesn’t mean you won’t also find a huge amount of crap in the stores (keyword: convenience food). Have you been travelling in Iceland and recognized other specalities?